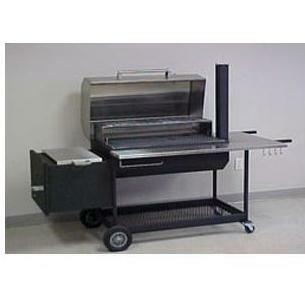 The Texas Barbecues 500 Brick-In Barbecue Pit/Smoker features over 1100 square inches of cooking surface. Cooking grids are built of heavy gauge expanded metal with welded steel frames. Grill is constructed of high quality, 304 stainless steel and heavy gauge carbon steel removable heavy gauge charcoal/water pan located in main pit chamber. The Firebox on the side of the grill also gives you the ability to cook on it. Lift the lid on the Firebox and there is a cooking grid that is 11 x 17 with a steel plate underneath it. You can cook on the plate or over your coals directly. The Firebox also has a removable ash pan for easy clean up. Also features large, easy to read thermometer, Stainless steel hardware and hinges. Lifetime burnout warranty on firebox. Cooking Grid Dimensions (in inches): Main Grid is 33×18, Warming Rack is 33×9 and the Smoker Box Grid is 11×17. GRILL ONLY ISLAND NOT INCLUDED.